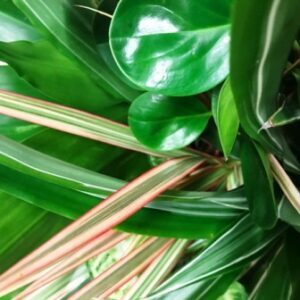 A new selection of tropical plants is now available in the Trademart. Gavin Bodilly, Alpine’s Trademart Manager has recently returned from an extensive tour of a number of independent nurseries and specialist growers along the East Coast. As customer demand for plant variety continues, Alpine is strengthening its relationships with the best plants people in the country. 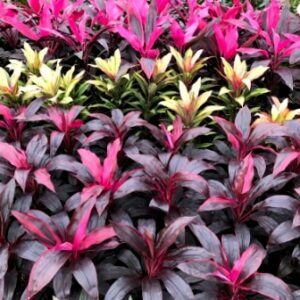 This assures our access to a large array of unique plant varieties, including tropical and indoor plants, readily available to our customers in good sizes and the highest quality. Fresh stock is already arriving in the Trademart and as always customers have the option to order through Alpine’s Sales Office or through Alpine Online. The new arrivals will complement Alpine’s own high quality plants and the regular independent growers within our Trademart. These 200mm hanging baskets are a mix of lush tropical foliage. Each basket is filled with a mix of Dracaena (Janet Craig, Deramensis, Bicolour, Marginata), Peperomia sp. and Syngonium sp. Perfect for hanging indoors or in a protected, shaded position outside. These species have low water requirements. If outside, hang in a warm shaded position and protect from strong winds; they will not tolerate salt laden winds. 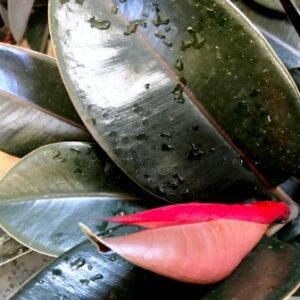 The thick shiny leaves of Ficus elastica are Burgundy, almost black. Keep this plant in a pot – it will grow vigorously to 30m + if planted in the ground. Roots are very invasive to pipes and building foundations. Ficus elastica is an ideal indoor plant. It is reported to be highly effective in removing toxins from the air, and this ability to purify indoor air is heightened the more toxins the plant is exposed to. Prone to root rot, avoid waterlogging by planting in a free draining open mix and water every 7 – 10 days if kept indoors. Leaf drop is an indication of too much water. The root system expands rapidly, so it is necessary to re-pot regularly. Cordyline fruticosa is a tropical understory plant. They are prized for their function in the landscape, bringing intense colour to a tropical garden design. They pair beautifully with lush green foliage palms. They will tolerate dark positions, but best colour intensity comes with good light. Protect from the cold, and plant in a shaded area. Avoid overwatering in winter and remove aged foliage as required. ‘Tartan, a bronze leaf with a white edge and highly sought after by plant collectors. ‘Firestorm’ is favoured for it’s dark leaves rimmed with an intense hot pink margin and hot pink new growth. ‘John Klass’ has dark green leaves with pink margins.